With the introduction of the industrial mobile computer 9700 Series, CipherLab has now completed their mobile scanning portfolio, and can now offer scanning and data collection solutions for the front of the office, all the way to the back of the warehouse. Sporting a reliable six-foot drop protection rating and an extended battery life of 13 hours, the 9700 Series has the necessary tools to work alongside the user on any job. The 9700 Series is has also taken CipherLab’s product line to the next level by offering Terminal Emulation on the device, with the option for either a standard numeric keypad or full 53-key alphanumeric keypad. A variety of scanner options further diversify the 9700 Series capabilities. Users have the option of a standard 1D laser scanner with a range of 12 inches, or an extended range 2D near/far imager which can impressively scan barcodes up to 50 feet away. These hardware options, in addition to the variety of software controls the unit supports, come together to create a highly versatile that will fit numerous roles and needs for the end user. 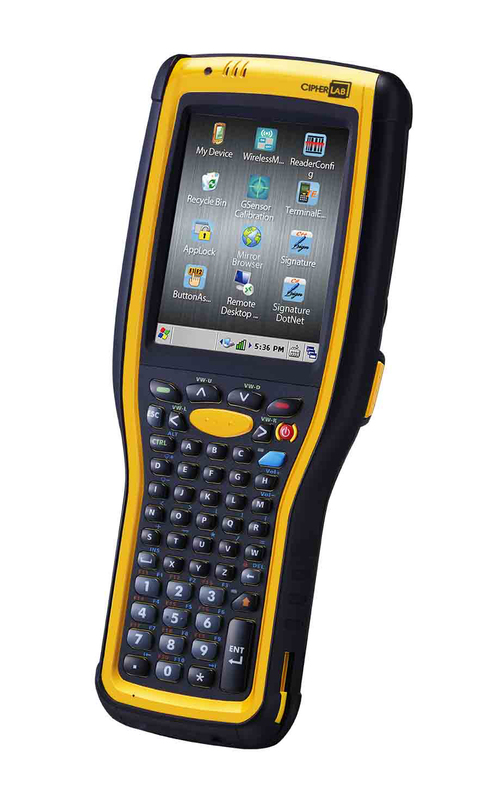 The 9700 industrial mobile computer series is a top choice for inventory control, data collection and scanning purposes in all warehouse, distribution center and manufacturing environments. Even with all of its features and functions, the 9700 Series is still offered as an extremely cost effective solution, coming in at 20% lower cost than most of its leading competitive models. Due to its diverse feature set, durability and affordability, the CipherLab 9700 Series has been awarded the EMS Industrial Mobile Computer of 2014. As a global leader in auto identification and data collection systems, CipherLab’s units are currently assisting many of the world’s largest companies operate more efficiently. While their U.S. headquarters is located in Plano, Texas, CipherLab also has offices in Taiwan, Germany, and China. Since their founding in 1988, CipherLab engineers have constantly worked hand in hand with industry partners to deliver superior products for their customer’s needs. Like us on Facebook to get updated news on industrial mobile computers and other special offers!